It's the rare small pup that does not like to get out for a walk with their pet parent. And, for pet parents it's a great way to interact with their fur kid, take a break from their day, to keep fit and even to socialize with other pet owners. When out walking though the one thing that is essential is that your pup is safe and secure. While a dog leash is the traditional way to go, more and more small dog pet parents are turning to dog harnesses, for lots of good reasons (more about that later). But as they become more popular there are more different options out there, which makes choosing the right one for your furkid hard. To help you get started, we took a look at some of the most popular no pull dog harness for small dog options available to come up with a list of our top four. Standard back clip, or a no-pull solution with the front clip option + car safety restraint. Functions as an auto or walking harness. Has a comfortable chest pad , 5 adjustment points + 10" dog seat belt loop. Padded mesh chest ,O-ring leash attachment + additional D-ring on the back of the harness. Lightweight harness, adjustable quick-release chest belt, D-ring for leash attachment + soft air-mesh padding. 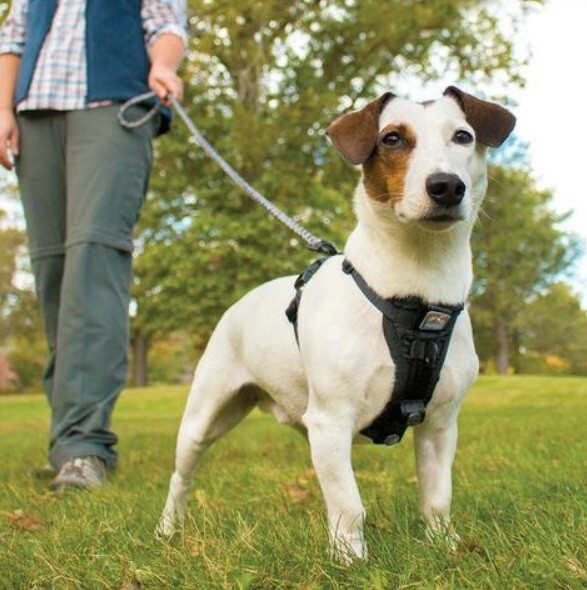 This hard-wearing padded chest dog harness functions as both an auto and as a walking harness for everyday use. 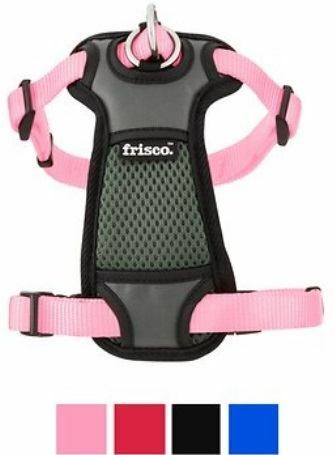 It is a sturdy, front clip harness that boasts a slightly larger vest plate that is padded for comfort and features a special extra - a buckling system that is compatible will any vehicle's seat belts, and so this crash tested vest keeps pups safer while walking and while being driven around. Their x-small size harness is best for toy breeds weighing between 5-10 lbs while their small size is best for small dogs weighing between 10-25 lbs. 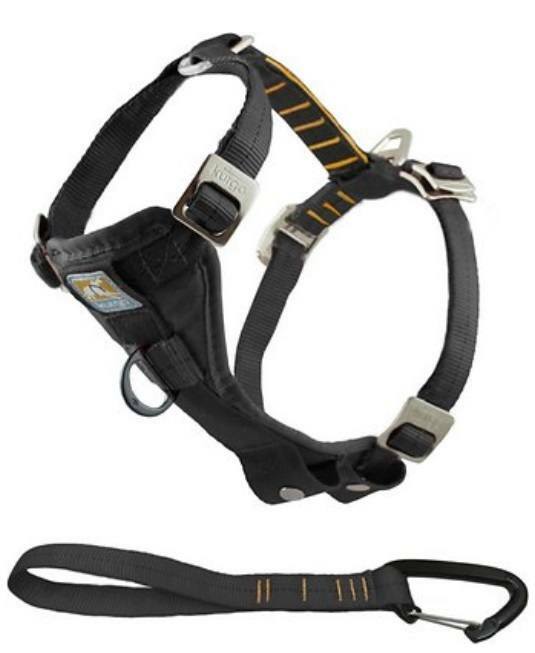 The Kurgo Tru-Fit harness is also notable because the steel buckle system it uses is the same as that used by mountaineers in their harnesses, meaning that they are extra durable and very secure. It fits well thanks not only to weight based sizing but also to a strap system that is very adjustable making it the perfect everyday dog walking harness. It's machine washable and also comes with a 10-inch lead for training or to use as a dog seat belt loop. Those who make use of this harness for their smaller dog praise it for its durability, and many comment on its surprising ease of use even though there are a few more buckles than usual. In particular owners praise it since it helps train their dogs to stop pulling on the dog harness while walking. This harness helps to eliminate the choking and pulling experienced with just a standard dog collar. The only negative mentioned is that it is harder to fit a very small dog into the harness snugly, and the vest area can be a little too large, so this may be best suited to a 'mid-sized' small dog. The '3 in 1' in this harness' name refers to the fact that it offers a front clip, a back clip and a car restraint attachment all in one product. Unlike many other dog harnesses it does not have a vest piece, and as it is essentially a series of straps can be easier to fit on a very small dog as snuggly and safely as their pet parent wants. The straps themselves are crafted of a very durable nylon and the clips from a tough plastic. They are also light reflective, so will help make evening walks safer for both human and dog. The straps are slightly padded for comfort and while it is nice and secure it is also reportedly fairly easy to get on and off. The PetSafe 3-in-1 dog harness does offer a slight resistance, and so, as some reviewers point out, it can be a great training aid for pups that need some work on their walking style. This lighter weight - but still very durable - front clip dog harness is offered for dogs of all sizes, but is an especially good choice for smaller pups who tend to be a little rambunctious when walked. 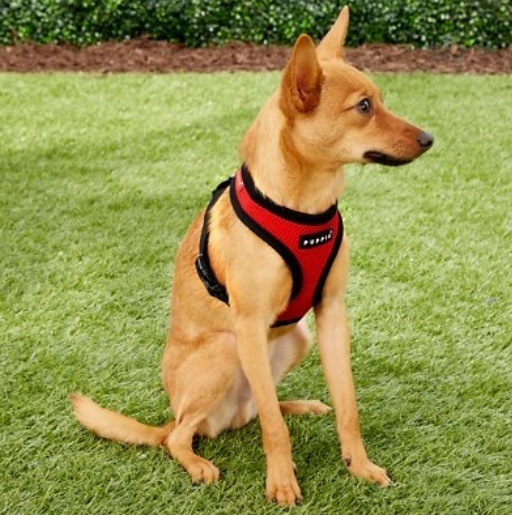 The vest element of this no pull dog harness is crafted from a padded mesh that is actually breathable and the clips and straps are, according to reviewers, easy to fasten but very robust. 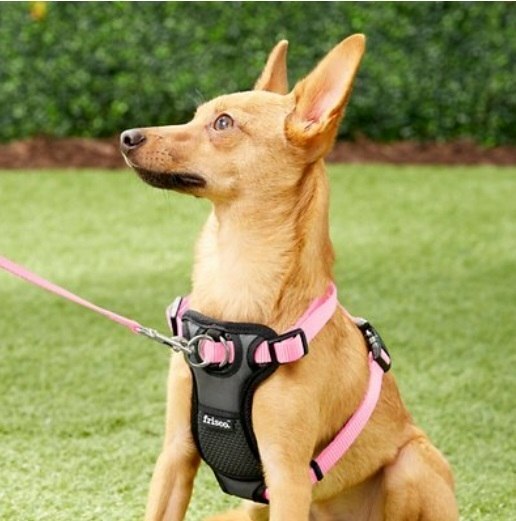 The straps are adjustable - and they do so with ease - and as it is only a two piece harness getting it on and off is, for most pet parents, a breeze. In terms of style the vest itself is black - a color that never goes out of style - and then it is available with straps in one of several different colors, including blue, pink and a nice, neutral khaki. It is nicely padded for comfort and there is an extra hidden bonus - a D ring on the back pocket that can be used to convert it into a back clip harness if you prefer. 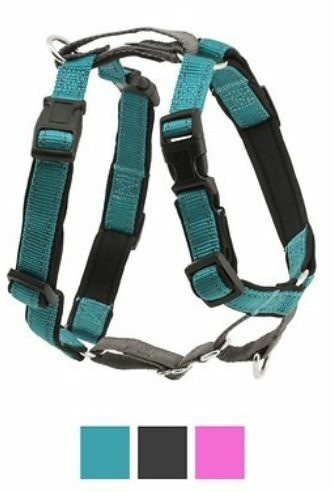 Fans of this harness praise it for the fact they feel that the front leash clip is placed very well - not as low as some other options - and the fact that it is relatively easy to put on even a wriggly dog. It's also a great harness that does a great job at helping with no pulling. Many of the reviewers have owned the harness for a year or even longer and report it to still be in great shape, so that is a testament to its durability as well. 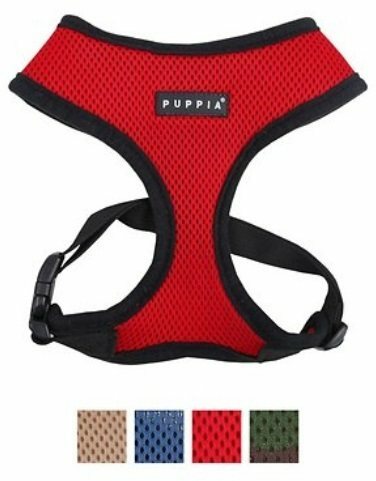 The Puppia Pet Harness is best for tiny pups and toy breeds. It offers a simple, all-in-one vest type solution that is very well suited for use by small dogs who wriggle a lot, as it is easy to put on and easy to snap into place securely. Its front clip is centrally placed in a position that many reviewers say is just right - not too high, not too low - and it is crafted from a softer, but still very durable nylon that is also ventilated to prevent overheating. Machine washable, but hand washing and air drying is recommended to maintain its durability and longevity. This versatile and affordable dog harness is great if your small pet pulls on the leash while walking, eliminating chocking and coughing experienced from using a standard dog leash. Many reviewers not only praise this harness for its ease of use and durability but also for its style, being lightweight and soft. The vest component is available in four different colors - green, blue, green and fawn - and is an all in one look that does not look as restrictive as some other dog harness options. Determining Which Type of Dog Harness Is Best For Your Pup? Some breeds do better with a harness. 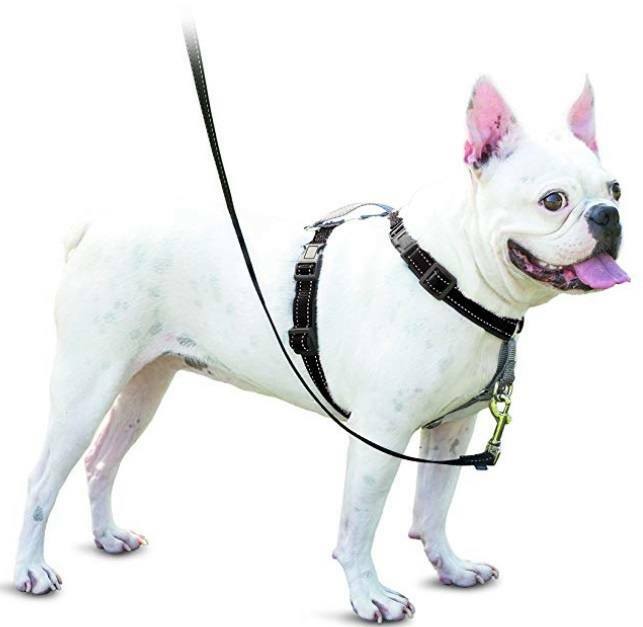 If you have a brachycephalic dog breed such as a Pug, Bulldog, Boston Terrier or Japanese Chin - a dog harness is a safer choice for your dog than a collar and leash for walking. These breeds have breathing issues especially in hot weather so it's important their airways aren't restricted. Even if you DON'T have a short-nosed dog breed - harnesses can be great for walking your dog. The harnesses on our list are some of the best options out there, but there are, of course, many other good options available to choose from for your small pup. What choice you may will be guided a great deal by what type of harness you want for your furkid, and which is best for their size, breed and habits. Here's a look at some of the most common dog harness types and their individual pros and cons. There are also other benefits of the dog harness style, including the fact that leashes don't tangle as easily as they might with a front clip harness, they are easy and they can be very cute, as many options are colorful and/or embellished. The front clip dog harness is the opposite of the option just mentioned. The leash clips to the front and the 'body' of the harness is more open. This is an option preferred by many dog trainers for difficult pups as it offers more control. It is still relatively easy to put on your pup but they may balk a little more at first. These work best if your dog has issues with pulling on the leash while walking. On the downside however the leash may become tangled far more easily and for a small dog this could be dangerous and frightening. This harness acts much in the way the old fashioned choke chain does; it tightens if a dog pulls too much, supposedly a mechanism that is a deterrent to the behavior. This can work well for larger dogs, and some very unruly smaller pups may benefit as well, but you do have to be careful not to allow the harness to tighten too much or it can be a very painful experience for your pup. 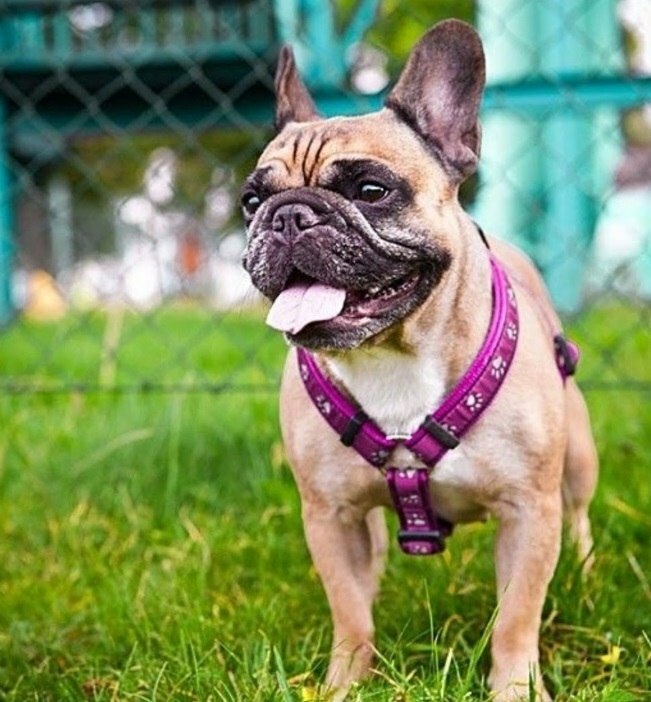 Because of the shape of the breed's face, Frenchies often do better with a dog harness like the Kurgo or the PetSafe 3-in-1. As we mentioned at the start of this piece, more and more pet parents are choosing to make use of a dog harness of some kind when walking their pooch. But why is that? What are the benefits of buying - and using - a dog harness when walking your smaller pup? Smaller dogs can be mini Houdinis, and wriggling out of a collar and leash is a skill that some of them just have. As this is basically a nightmare situation for any pet parent the more control and security you have when out walking the better. Dog harnesses - especially back clip dog harnesses - offer far more security than a leash and collar alone but they do not mean that your poor pup has to feel like he is being walked in a straightjacket! Leashes attached to collars naturally put some strain on the neck, even if held with a minimum of pressure. Smaller dogs have delicate little necks in many cases and moving the leash away from it can help prevent pain and accidental injury. Getting the leash away from their neck can also be beneficial for small dogs with short noses (brachycephalic breed) - breeds like French Bulldogs, Pekingese and Boston Terriers - as they already sometimes have a harder time breathing and restrictions around their neck do tend to make that worse. Walking a dog that is unruly is not a great deal of fun, which is why dogs need to be properly leash trained from the start. Making use of a harness can make this process a lot easier for both pet parent and fur kid and, in the cases of some small breed dogs it can even help improve their gait. What Should You Look for in a Good Dog Harness? There are a number of things you should pay attention to about the item itself when shopping for a dog harness, including all of the following four key elements. It is imperative that you ensure that the harness fits properly. If it is too big it will be easy for your pup to slip out of it, defeating the purpose of wearing it all. If it is too small it may be impossible to fasten properly, and even if you can 'squeeze' your pup into it wrong it while walking may just cause them too much pain. Kurgo have made a short video on how to properly measure out your pup for a dog harness. If the materials used to craft a dog harness are flimsy it's likely that it will break far more quickly. Look for harnesses crafted with durable materials that are also well made (especially when it comes to stitching) and that don't feature cheap, flimsy clips that will probably 'unclip' far too easily. Remember that straightjacket feeling we mentioned? That is the last thing you want to put your pup through. 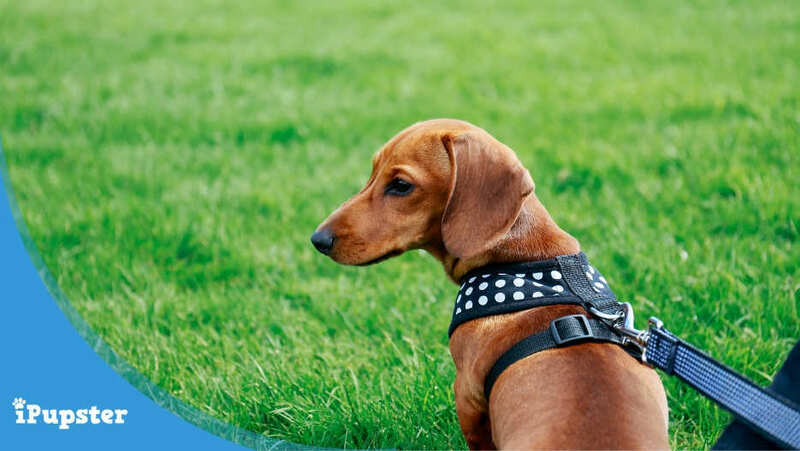 Things like padding and softer materials can help make the dog harness more comfortable for your pup to wear. Should style really be a consideration when shopping for a dog harness for small dogs? Why not? You would not want to wear something terribly ugly to head out and about in public so why should your dog? Finally, Pet Circle's in-house veterinarian, Dr Carla shares some really great tips in this video on how owners can measure and fit their dog with each of the five main types of dog harnesses: a vest harness, a step-in harness, padded chest harness, a dual strap harness and a halti training (or front-pull) harness.